Hiring Discrimination for Smokers, Obese Rejected in U.S.
WASHINGTON, D.C. -- Fewer than one in eight Americans, 12%, say companies should be allowed to refuse to hire people because they are significantly overweight. Similarly, 14% of Americans say companies should be allowed to refuse to hire smokers. 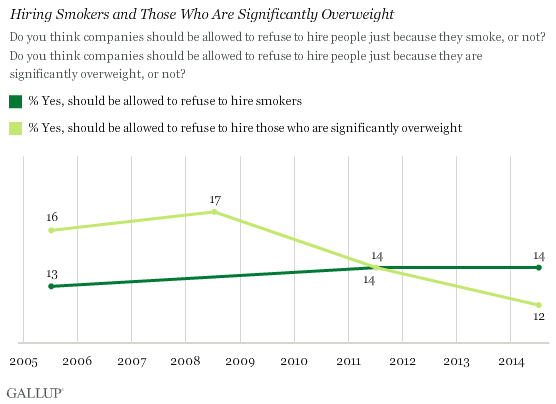 While Americans are just as likely now to say that companies should be able to refuse to hire smokers as when Gallup first asked the question in 2005, they are slightly less likely to say that companies should be able to refuse to hire those who are significantly overweight. The 12% of Americans who say companies should be able to refuse to hire those who are significantly overweight is down slightly from 16% in 2005 and 17% in 2008. These results come from Gallup's July 7-10 Consumption Habits survey, in which 21% of Americans reported having at least one cigarette in the week prior to being interviewed, near the historical low. Furthermore, in the same poll, 40% of Americans said they consider themselves to be "very" or "somewhat" overweight. While Americans overwhelmingly reject the idea of hiring discrimination against smokers and those who are significantly overweight, they are more amenable to the idea of charging these individuals more for health insurance. In fact, a majority of Americans, 58%, say that it would be justified to set higher health insurance rates for smokers. Fewer Americans -- but still a substantial minority, at 39% -- say higher rates would be justified for those who are significantly overweight. These figures are both slightly lower than in 2003, when Gallup first asked these questions. At that time, 65% of Americans said that smokers should pay higher health insurance rates, and 43% said the same about those who are significantly overweight. Smokers are much more likely than nonsmokers to oppose hiring discrimination and higher insurance rates for those who smoke. While a quarter of smokers say that higher insurance rates are justified, only 3% say companies should be allowed to refuse to hire smokers. Former smokers' views are similar to those of nonsmokers in general, indicating that current smoking status is a larger determinant of views on these issues than is past history of smoking. While similar differences exist between Americans who say they are overweight and those who say they are "about right," they are not as pronounced. Thirty-two percent of overweight Americans say higher health insurance rates for those who are overweight are justified, compared with 44% of Americans who say their weight is about right. Overweight Americans are just as likely as those who say their weight is about right to say that companies should be allowed to refuse to hire overweight Americans. Most Americans oppose hiring policies that would allow companies to refuse to hire smokers or those who are significantly overweight. 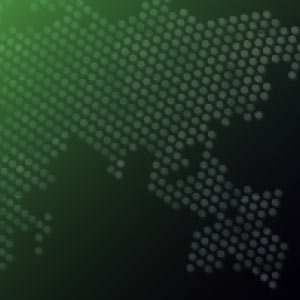 It is unclear if those views are because Americans do not think smoking and obesity negatively affect workplace performance or they simply reject discrimination of any kind in hiring. Some workplaces, many of which are hospitals, justify policies of not hiring smokers by saying they increase productivity and cut down on healthcare costs. A Texas hospital began extending this policy to those who are obese for similar reasons, but later reversed the decision. While higher health insurance rates are acceptable to more Americans, particularly for smokers, it is still a controversial idea, even though smokers have long had to pay higher life insurance rates. However, smoking and being overweight are associated with higher healthcare costs. The Affordable Care Act allows for higher insurance premiums for smokers, and while the majority of Americans say this type of policy is acceptable, nearly four in 10 say it is not. Advocates for both of these ideas -- allowing companies to refuse to hire smokers and those who are overweight, and charging these individuals higher health insurance rates -- say the tactics would help encourage people to live healthier lives. 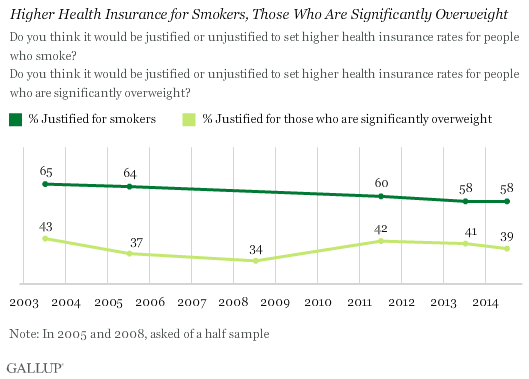 So far, however, Americans are only on board with charging smokers higher insurance premiums. For results based on the sample of 176 smokers, the margin of sampling error is ±9 percentage points. For results based on the sample of 837 nonsmokers, the margin of sampling error is ±4 percentage points. For results based on the sample of 249 former smokers, the margin of sampling error is ±8 percentage points. A majority of U.S. smokers see increased taxes on cigarettes as an act of unfair discrimination against them. At the same time, a majority of smokers believe restrictions on smoking in public places are justified. The uninsured rate in the U.S. dropped to 13.4% in the second quarter of 2014 from 15.6% in the first quarter. This is the lowest rate recorded since Gallup and Healthways began tracking the percentage of uninsured Americans in 2008.